Would you like to exhibit your photography at one of Cardiff’s most prestigious exhibition spaces and have your photos published in Cardiff Life? Photo Junior has joined forces with I Loves The ‘Diff to create a one-off photography competition that gives everyone the chance to do just that. Cardiff Clicks is a fun and free competition sponsored by CPS Homes, sales and lettings, that aims to bring families together and celebrate our city. It’s open to everyone, whether you’re aged 6 or 106. Finalists of all ages will have their photos hung at the Cardiff Story museum in the Old Library, The Hayes at a special show in November. There are no rules, no entry requirements, and any camera (or mobile phone) can be used. 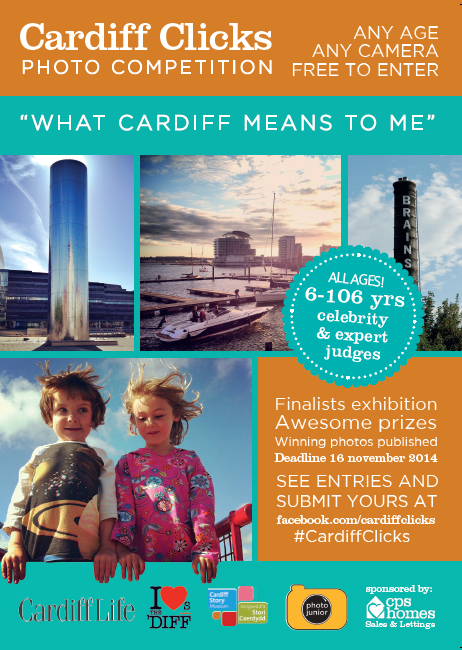 Just send us your photos of ‘What Cardiff Means To Me’ to be in with a chance of winning. Our panel of expert and celebrity judges are looking for unusual and emotive photographs that depict the beautiful city or express what Cardiff means to individuals. They’re not necessarily looking for landmarks or fabulous sunsets. We want an array of all kinds of images. There are three age categories: Juniors up to age 12; Teens are 13-18; and Adults (19 and over). The winning prizes will include a digital camera for the under 12s and photography equipment vouchers for the older categories. The top five photos from each category will be printed and exhibited at the Cardiff Story museum, with winners invited to a very special preview launch on November 28th 6–8pm. The winning photographs will also be published in Cardiff Life Magazine.